Steel makers had cut production, directly affecting the demand for ore. In January-June, global crude steel production fell by 21.3%. The situation is better now, with output in August down by only 5.5%. Iron ore demand is expected to improve on the back of rising steel production. Vedanta expects consumption to grow from 896 million tonnes (mt) in 2008 to 1.18 billion tonnes in 2011, and Asia will account for at least 90% of the increase. 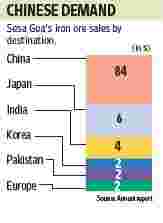 Emerging markets, particularly China, will contribute to this higher consumption. But the outlook for ore prices is still hazy. The iron ore trade is expected to remain weak until the first half of 2010. While prices are off their cyclical lows, they are not expected to return to the peak any time soon. China’s slowing imports is the main reason. That is a worry for Sesa Goa, as China accounts for 84% of its revenues. In 2008-09, for example, Sesa Goa added around 54 mt to its reserves, taking the total up to 240 mt. Still, if its output increases at an average 20% annually, its reserves will last only for six-seven years. Of course, this is notional as it can explore for new resources at its existing locations, as it did in 2008-09. But such growth will be incremental. Sesa Goa is, hence, focusing on acquiring mining assets. It has enough cash to do that, with around Rs2,200 crore in liquid investments and Rs1,000 crore as inter-corporate deposits given to group company Vedanta Aluminium Ltd. If it is raising more capital, a large expansion or acquisition plan seems on the anvil. It will get Rs2,400 crore from its foreign currency convertible bond (FCCB) issue and the remaining Rs3,400 crore will be raised when required. Investors are concerned about the effect of an equity dilution, given its current market capitalization of around Rs20,000 crore and the uncertainty surrounding proposed acquisitions. The firm, however, seems quite confident, having set the FCCB conversion price at Rs347, which is 35% higher than Friday’s close of Rs256.80.